Sunday was a big day for me! I revamped my life, well at I’m least trying too!! After my wake-up call from Jenny, I decided I need to re-adjust my lifestyle just a tad bit. I’ll get to that in a moment, but first I wanted to show you my latest and greatest drink. 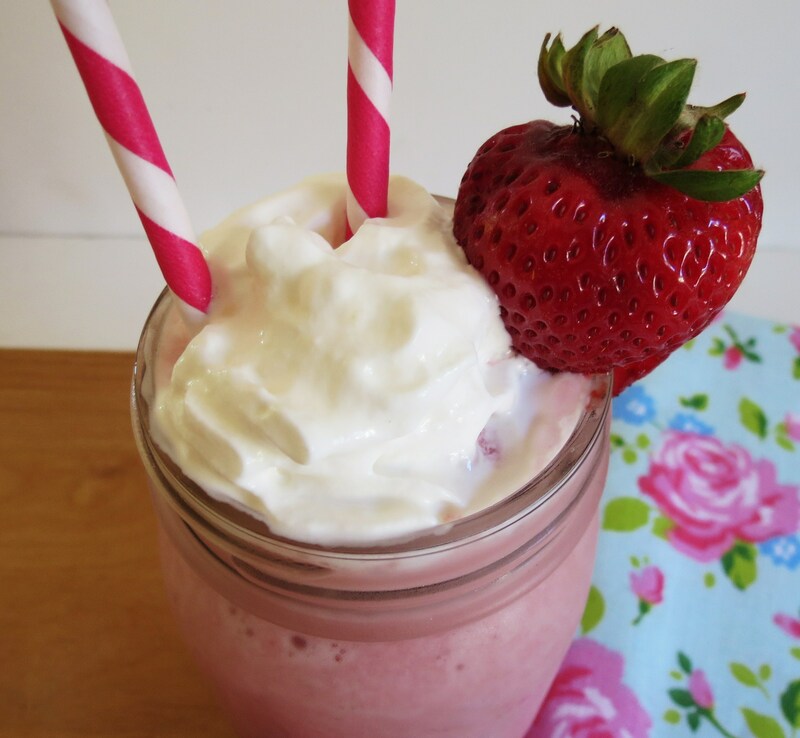 You are looking at my healthy version of Starbucks Strawberries and Cream Frappuccino. This drink is creamy, sweet and simply delicious! I tested this out on my Hubbie, who is not a big fan of strawberries, and he said this is really good!! He drank it right up. Than I told him there wasn’t any yogurt in it and he was like really, it’s really good. I get a better response from him when I informed him of no yogurt. He hates yogurt, only because I love it so much!! This Frappe is completely healthy and vegan! 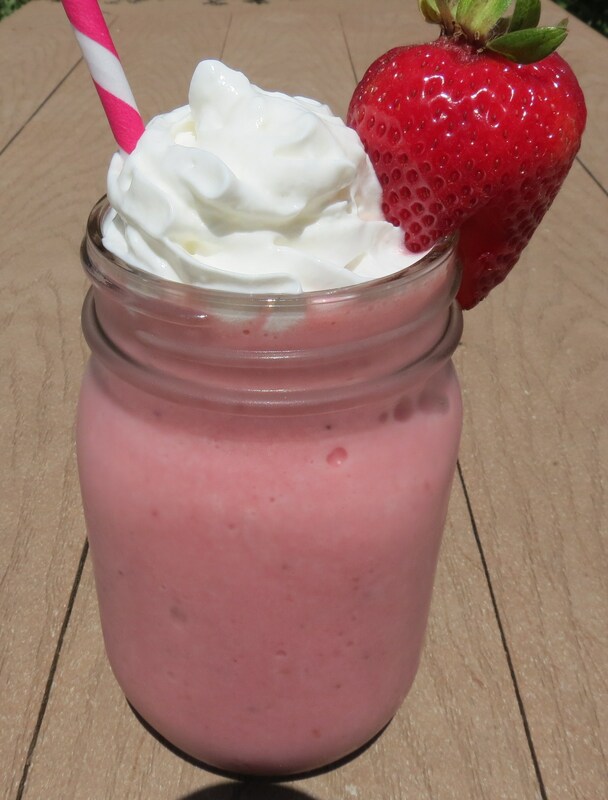 I made it with frozen unsweetened coconut milk, frozen and fresh strawberries, a pinch of vanilla extract and one packet of stevia. This drink in my opinion is way better than Starbucks. Sorry Starbucks, you know I love your drinks, but this one is so much better than yours. nah nah! What gave this drink the creaminess is the coconut milk. I am so happy Trader Joe’s now carries it. I love it!!! I microwaved the frozen strawberries to get the juice from the fruit. It added the extra flavor to the drink. I also used the most over ripe strawberries that I had, that were so sweet. I used packet one of Stevia,to sweetened the drink a little more. The little bit of vanilla I used gave it a dessert like taste. I am very pleased with this drink, this is another one that will go in my drink rotation. 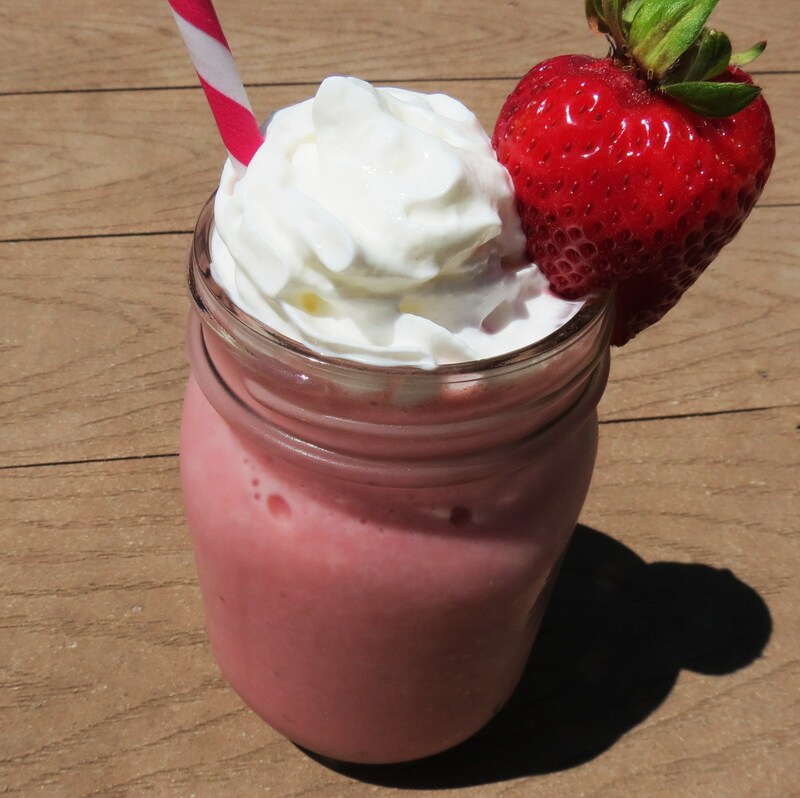 So if you’re looking for a healthy version of Strawberries and Cream Frappuccino, this is the drink for you. Now you know I always have to do my comparisons, let’s see how I did. Not to bad! Mine is more than half the calories and look at the sugar difference. The fat in mine is a healthy fat, so don’t be afraid of it! Also the carbs, are way lower! he he I love this! 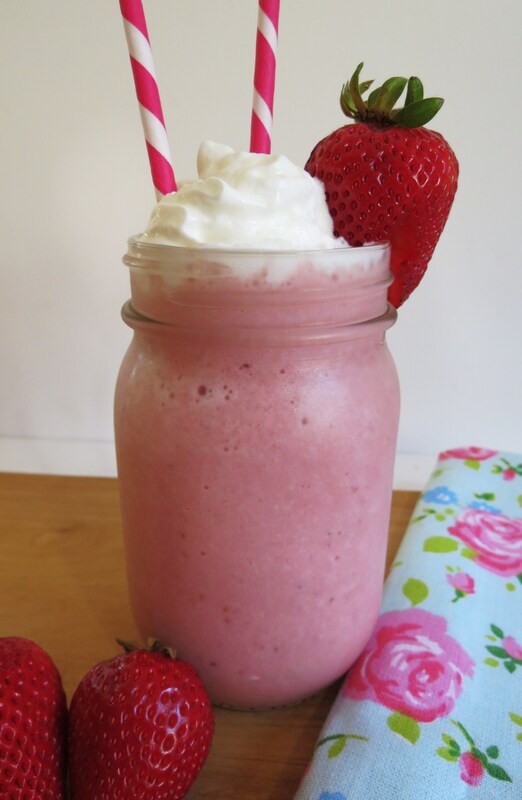 A sweet, creamy, healthy drink made with coconut milk and strawberries. Freeze coconut milk in a shallow dish. Once frozen, leave on counter to thaw a bit or microwave for about 30 seconds until it's thawed enough for your blender to handle. Just don't overheat it. In a microwave safe dish add the frozen strawberries and defrost for about 45 seconds. Mash strawberries with a fork. You are looking for the juice of the strawberries. 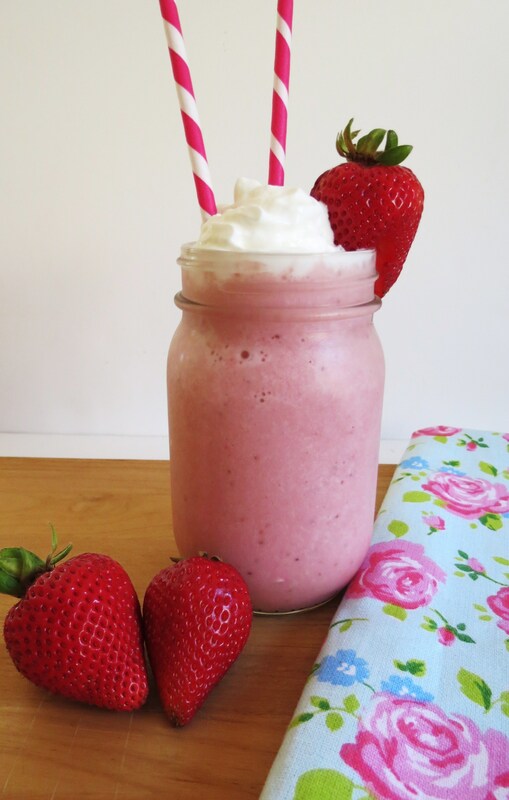 In a blender add coocnut milk, vanilla extract, frozen strawberries with the juice, fresh strawberries and stevia. Crush/blend until incorporated about 2 minutes. I wanted to tell you about my new lifestyle change. The reason I originally started this blog was to stay accountable for my weight loss and issues I may have. I figured if I told the world what I was doing, than I would have to stick with it!! I always keep my word, but some how I fell off that and basically started blogging just about healthy recipes. I found a new love for cooking and I wanted to share it with you, but some of my priorities got a way with me. Now don’t get me wrong, I still plan on sharing a healthy recipe with you just about everyday, as I have been, but I also need to talk about my health and fitness goals. I know a lot of people have weight issues and there are lucky ones who don’t but, I fall under the issues category. I know I will always be the person, who has to always have to watch what they eat and exercise. I don’t mind doing that, I find it fun, most of the time, but I just need to remember that and not let it slip away. So today I want to share with you some of my new goals. Exercise 5 days a week for at least 30 minutes, no blogging until it’s done! Thats it! Pretty simple!! I’ve been pretty much following the eating portion of it, but the exercise part is hard. Sunday I got up I put on my new heart rate monitor and did HIIT (high intensity interval training) which basically is speed up, slow down, speed up slow down, kind of like driving in commute. 🙂 I did it by jogging and then speed walking for 3 miles, and I burned 430 calories! Woohoo!!! Thats a lot for me, since normally when I did that in the past I would burn about 335 calories. I’m so happy about this! My heart rate was around 149, and the max was 179. Not to shabby!! This is how I did it. I started out by walking fast, than jogging and I would push myself as hard as I could for as long as I could, probably about a minute, than I would slow down, speed walk and once my heart rate started to go down to far I would jog again. I let my heart rat monitor tell me when I needed to push myself. During the last few minutes before I was almost home, I just walked to cool down, than stretched afterwards. You have to know I am not a runner or jogger, I don’t like it, but I felt amazing afterwards. I am going to try to do this every Sunday morning. After my workout, I had a big bowl of steel cut oats with blueberries, peaches, honey and a dollop of greek yogurt with cinnamon. It tasted wonderful and I never realized how yummy peaches and blueberries are together. To keep up with my healthy lifestyle I decided to make a trip to Target to pick up some nuts and some new workout clothes. There having a big Clarence sale. I got a nice tank with a built-in bra for $12.00 and matching shorts for $8.00. Plus they are having a sale on regular in stock workout clothes. You should check it out. Oh and I also got some Glad Freezerware for some batch cooking that I plan on doing, I just haven’t gotten around to it, but I will. After Target I went to Trader Joe’s for my weekly shopping trip. This was a big one, kind of a pricey one, but I wanted to be stocked up on healthy foods for the week. I have some new recipes I want to try out! 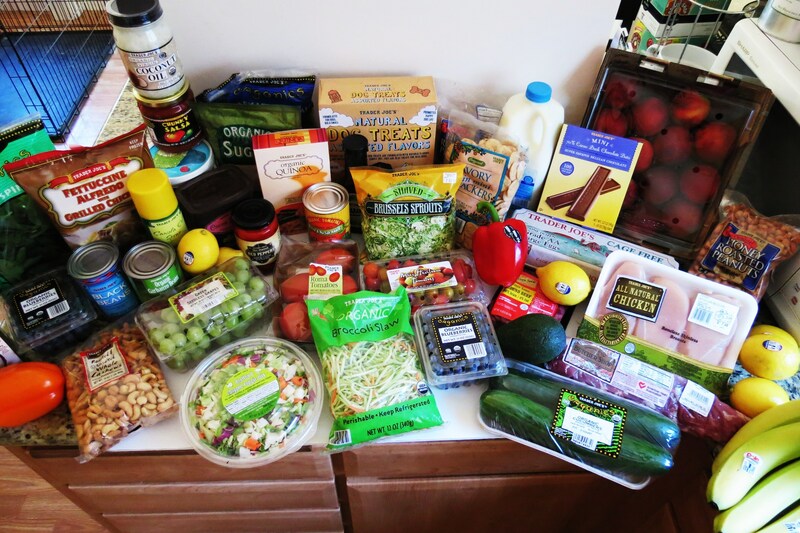 I spent $149.00 at Trader Joe’s, but I got some good stuff! Not everything could fit in the picture. Lots of goodness going on in that picture. Now I need to get chopping and start making my big batches for the week. Oh, but I guess I should make dinner first. Hmmm, what should I have? Off to do some cooking! P.S. One last thing, remember, I am just like you, and if I can do it, so can you! So make a tiny healthy change today and you’ll be glad you did. I love that you gave us calorie comparisons! That’s a real eye-opener. And good luck on your new healthy initiative. I’ve always wondered why there was so much buzz around the FT4 — now I know! That looks SO high-tech. When my Barska HRM finally dies, I may look into a Polar model. Back in the day, I used to get the Starbucks Grande Peppermint Mocha with non-fat milk and no whip cream, thought I was doing good and found out I was consuming over 300 calories per drink! I don’t get how they have such high calories? It’s crazy. When I found out how many calories were in my drink it was an eye opener for me. Thats when I decided I would only have it as a treat! 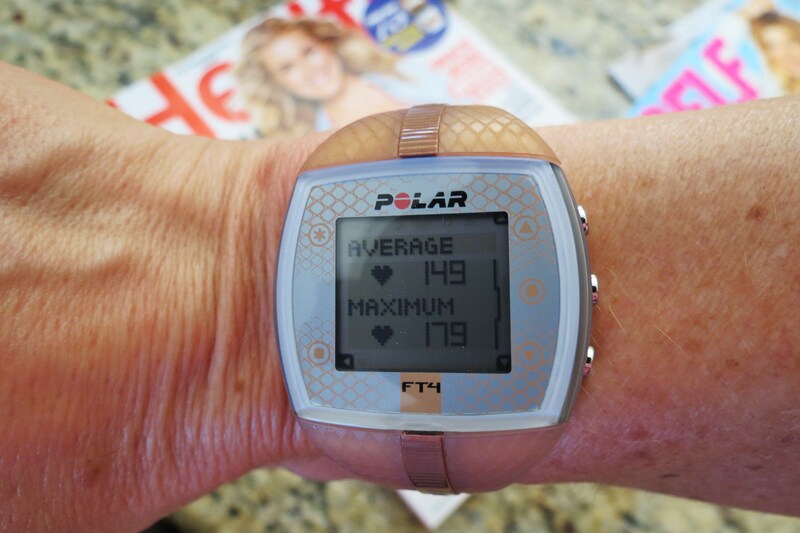 I love my Polar HRM, but I hate wearing a strap, but they claim that is the best way to get an accurate heart rate. The price wasn’t bad on it, I found it at Sports Authority for $79.00 which isn’t bad compared to a lot of other watches out there. 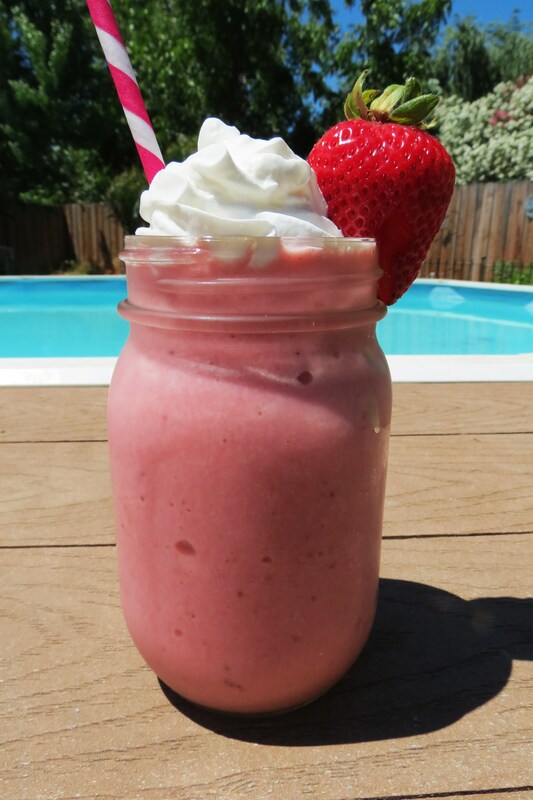 That looks so refreshing! Good for you for writing down a plan and all your goodies you got shopping look like things I’d be throwing in my cart! Ha I LOVE targets workout clothes! I know I love Target clothes too and the prices are pretty good. I figured if I write my plan down I’ll stick to it, so far so good!! Let’s hope I feel this way by the end of the week! I always adore your Starbucks redo’s! Each one looks more delicious than the last. I’d love to wake up to this frappe. Yay for getting back to your healthy living goals! I’m trying to get back on track also and stick to 1500 calories a day…it’s hard sometimes but SO doable! I couldn’t agree more about the calories!! You know when you make something so good, it’s hard to have a little!! You’ll be fine, once your back up and running again. Hope your feeling better!! Now this is my kind of smoothie. Coconut milk makes everything better, doesn’t it?? Yes it does!! It makes the drinks so creamy!!! I’m sure one of them will have it!! I just feel in love with coconut milk, yet I don’t care for coconut water, which is weird! Thank you Tara! I’ll stop by and check it out!! Thank you again!! New workout clothes are always a huge thing for getting me motivated – good thinking on the shopping, and great deals!! Good for you for recommitting to taking care of you! The best therapy is shopping! I know my credit cards tell me so! 🙂 You have to try the Strawberries & Cream frappe I made, you’ll love it, maybe even better than Starbucks? Ahhh, I will most definitely try to make your drink for you in the winter. I love peppermint hot chocolate!! Yum! good for you with the changes you are putting into place! 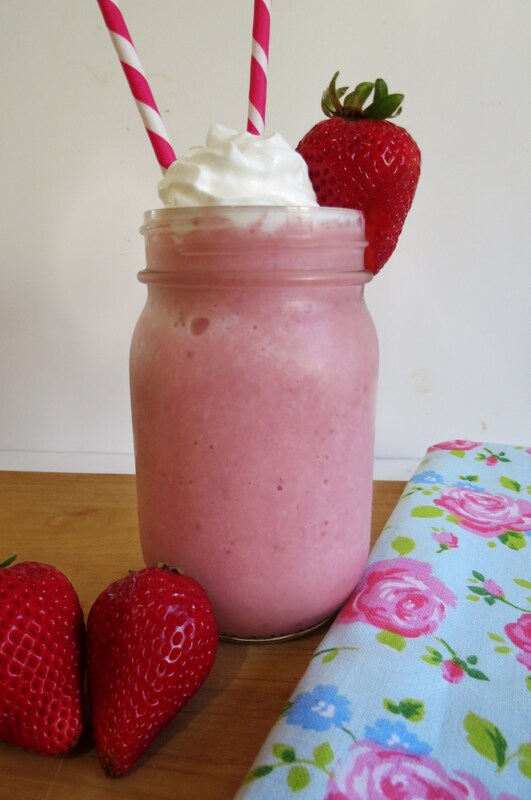 and this looks delish…I made a strawberrries ‘n cream smoothie a few months ago and wow, I need to try the frapp! Thanks Averie! I’m really trying and it’s so hard, especially since I just made chocolate chip cookies for my Husband! Oh that dough gets me every time! Jen, this frappe looks delicious. I love that it’s vegan. You are the frappe queen! Ahhh thanks! I have fun creating them!! I came over from Pinterest originally, and now I’m here all the time. Love your blog! One question, though. I am allergic to coconut, How well do you think Almond Milk would fare for this type of recipe? Would it be creamy? Hi Jessi, I never worked with Almond Milk, so I’m not to sure. The taste maybe off a little, but I’m betting it would work. I recommend trying it out and seeing what you think of it. Maybe regular non-fat milk will work too or Vanilla Almond Milk, I believe they make that. I would experiment with it, I’m betting either way it will taste wonderful!! Let me know what you try out and what the outcome is. If almond milk tastes good, I’ll give it a try! I actually use unsweetened almond milk in my banana smoothies, and it’s wonderful. A bit silky. I wouldn’t quite call it creamy, however. I’ll try it out soon and report back! Ok, report back!! I look forward to hearing from you! I can understand how hard it is to stick to a routine. I have get my workout routine going again! I love the aspect you brought up of not blogging before the workout is done 🙂 I think I will try that one as well! Good morning! 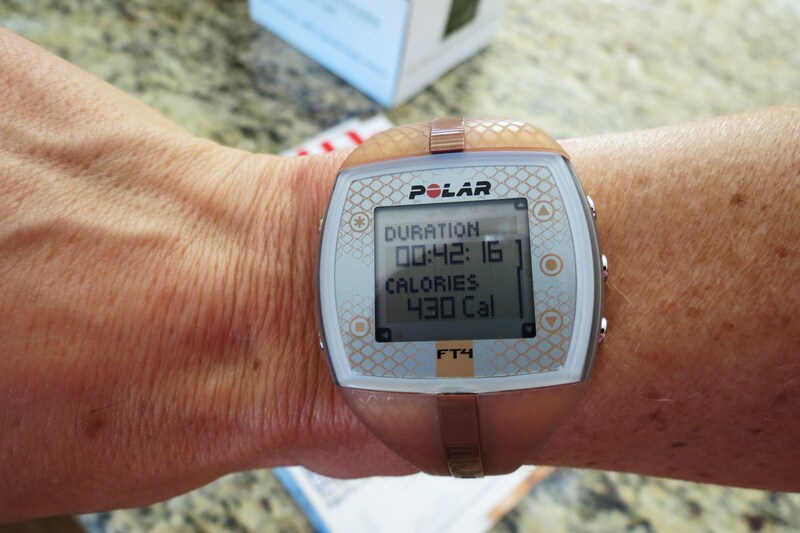 Exercising before blogging only worked 4 days this week, but it’s better than nothing! 🙂 I did try, but this week I’ll try a little harder. Have a wonderful Sunday!! Your post is so inspiring!! Wow. Thank you for sharing with us. Your frappe looks delicious and perfect for that sweet tooth. 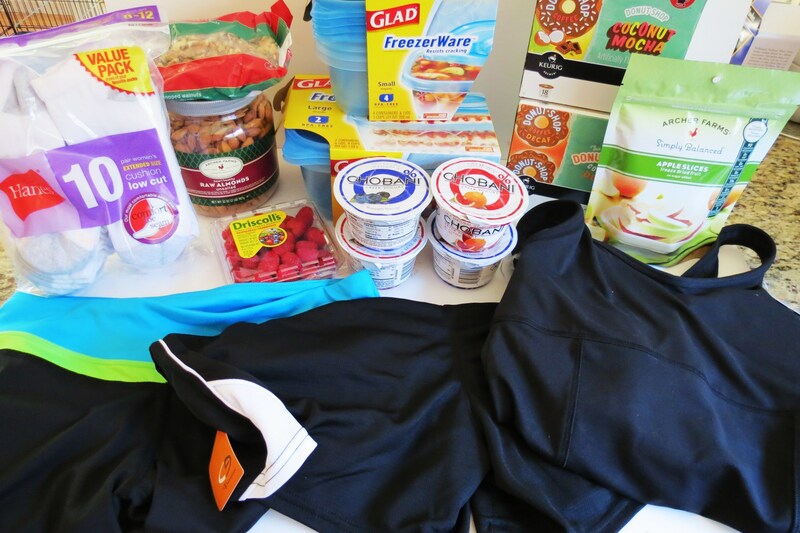 I am going to be featuring you this week on Allergy-Free Wednesdays. Your post is full of positive, motivating energy. I love it. Great job and keep up the great work. Ahhhhh thanks Amber I appreciate it!!! 🙂 I love Allergy-Free Wednesdays, it inspires me to cook healthier! Thank you so much Amber, I’m honored!! I just love Allergy Free Wednesdays!!! I won’t be able to join next next. but I’ll be back the following! I’m curious what brand of unsweetened coconut milk you use. I have used several and they are all about 280 calories/cup. This is regular, not light coconut milk, and not coconut cream, which has more calories. I love the look of your drink, but not with such high calorie coconut milk. Would love to know what you use. Thank you!! And thank you for picking it on your Friday Finds! Awesome, delicious and healthy recipes! Thank you so much for sharing!!! Anytime! This is one of my all time favorite drinks!! This is my favorite drink at starbucks. I’m going to have to try this so I don’t feel as guilty after having one! If you do try it, let me know what you think of it. I used to have like two of these a day from Starbucks. Should freeze just beautifully, I’m working on more liquid intake. I have a couple of questions… are you talking about using canned coconut milk found in the Asian section of the grocery store or the kind you find in a half gallon carton in the milk department? Along the same lines, how many servings for this recipe? It seemed like if it were for one person, it may be higher calories than what you had listed. It looks really yummy. And thanks for your tips. Hi Nancy! For the topping I used a little bit of strawberry greek yogurt and a mint leave to make it pretty. Hmmm… I tried the recipe but it tasted like water, I but extra sugar in it, and my strawberries were really good. Wow! This looks amazing! I’m just wondering, I’m not sure if you can taste the coconut in the drink. But either way, I’m not a big fan of its flavor. Is there anything that would be a good substitute? Sorry if this question has already been asked. Thanks! Honestly you don’t really taste the coconut, but I would use another kind of milk, like non-fat, almond or soy milk. Also I recently made this, by adding the strawberries, stevia, some ice cubes and then milk, instead of freezing the milk. It worked like a charm. Let me know what you think. You could sub any kind of milk you like. The texture may not be as thick, but the flavor will be the same. Also, I recently made this without freezing the milk, by adding the strawberries, stevia, some ice cubes and then milk to the blender. It worked like a charm. Let me know what you think. Thank you! You can feature it, as long as you link it back to me! Thank you and have a great evening!! I posted the feature and you can check it out here! Hope you like it. Just found this recipe, looks amazing! Unfortunately, I don’t have coconut milk. Would Almond Milk work? Love the blog name too! Hi I just found your recipe and im looking forward to trying it can you please tell me what kind of whip cream on top you used? is is pre-made or did u make it? I used Redi-Whip Fat Free Whip Cream. It’s 5 calories! I hope you like the frappe if you try it!